For potato farmers in the north and wheat growers in the eastern parts -- particularly in Jharkhand, Bihar, and Odisha -- the recent rains could in fact be beneficial. An extended winter, with bouts of rain, has raised worry of a fall in the final yield of some rabi crops. 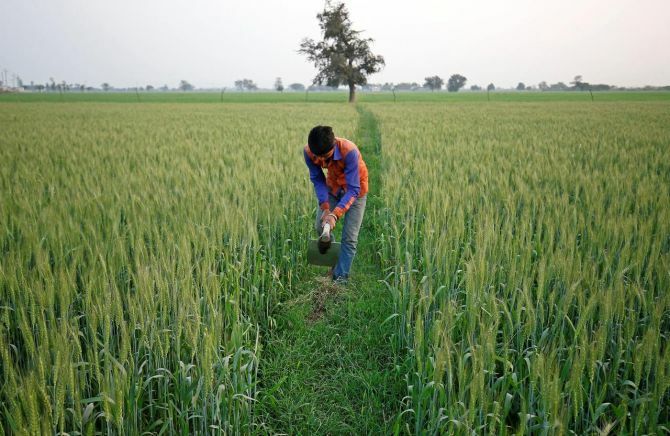 However, experts say barring a few places, the showers haven’t been enough to cause large-scale damage to most standing cereal or horticulture crops, except for mustard in some parts of Rajasthan. Ground reports did say the standing rabi crop was flattened in some places of Madhya Pradesh and western Uttar Pradesh in the rain over these regions in the past few days but the actual impact is still being assessed. In the post-monsoon October to December period, rain was less than normal. It picked up pace in the past two months. According to the India Meteorological Department, February got 22 per cent more than the average rainfall in 2019. The first two months of the year saw the highest quantity of rain in the past five years. An unusually high number of western disturbances, with other climatic factors, led to the rise in bouts of rain which has extended the winter season. Normally, during this time of year, there are one or two western disturbances each month that cause snowing in the hills and winter rain in the plains. This year, their number has been more than that. “The rains have been more in Rajasthan, Punjab, Haryana, Madhya Pradesh, and western Uttar Pradesh but the intensity so far hasn’t been big enough and every bout of rain has been followed by a few days of bright sunshine,” said Mahesh Palawat, chief meteorologist at private weather forecasting agency Skymet. Going forward, he added, the intensity of western disturbances would decline and warm weather set in. A K Singh, deputy director-general at the Indian Council of Agricultural Research, said apart from the mustard crop in some parts of Rajasthan and in some leafy vegetables, there hasn’t been report of any large-scale damage. For potato farmers in the north and wheat growers in the eastern parts (particularly in Jharkhand, Bihar, and Odisha), the recent rains could in fact be beneficial. In the main wheat belt of northern India, Singh said he hadn’t got any report of large-scale damage to the standing crop. “In South India, these rains are good for paddy. For mango, there is no impact, as flowering hasn’t started in the trees,” Singh said. He felt wheat production would be a bumper one this year, as also with potato. Last week, the central government issued its second advance estimate of foodgrain production. This said wheat production in the 2018-19 season was expected to be 99.12 million tonnes (mt), marginally less than the 99.7 mt in last year's final estimate; overall grain production was projected to fall slightly to 281.37 mt. It was 284.83 mt in the 2017-18 crop year (July-June), by the fourth advance estimate; the second advance one for that year was for 277.49 mt. Will there be normal monsoon in 2019?